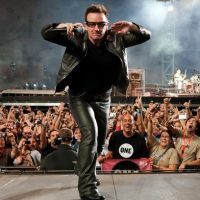 Before we get to the article, you need to know that U2 front man Bono is an outspoken “Christian.” Bono may profess Christ, but his beliefs do not line up with what the Bible teaches on much of anything. In fact, Bono’s Jesus has been reimagined to fit in with the rock star’s decidedly “progressive” worldview. His social justice Jesus is not the biblical Jesus — not even close. For more on Bono’s unorthodox beliefs, check out Does U2’s Bono, A Professing Christian, Believe the Bible? On Tuesday, the popular Irish band U2 tweeted its support for repealing Ireland’s pro-life Eighth Amendment and legalizing abortion on demand across the Emerald Isle. “Tell me again how they’re like totally Catholic and stuff,” the Creative Minority Report blog sarcastically responded. Ironically, the “repeal the 8th” graphic U2 tweeted was heart-shaped. U2’s lead singer Bono is known around the world for openly proclaiming Christianity as his faith. There is even a “U2-charist” movement aimed at normalizing U2 songs as church music.